Viburnum tinus has been popular in landscapes for a long time. It has been grown at least since the Roman Times. Viburnum tinus compactum grows in sun or shade. Viburnum tinus compactum is not fussy about soil type and for many gardens will get by just fine on what nature provides once established. 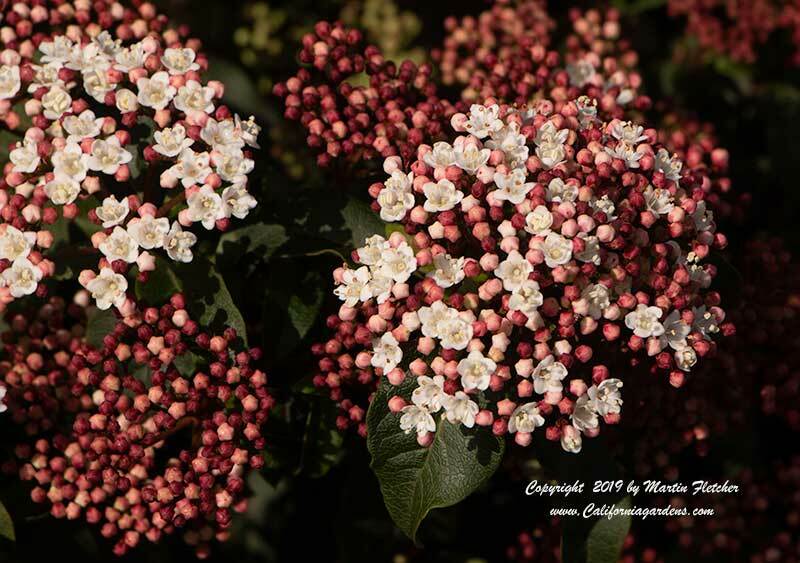 Viburnum tinus compactum blooms Spring into Summer and has berries favored by seed eating birds. Viburnum tinus compactum will occaisionally self sow but is not typically a problem. Viburnum tinus compactum grows up to 5 feet and is often used as a hedge. Viburnum tinus compactum has white lightly fragrant flowers. Viburnum tinus compactum is winter hardy to 0° F.
White flowers and foliage of Viburnum tinus compactum - Arrowwood. High resolution photos are part of our garden image collection.